So about that kale salad that went alongside last night’s brick chicken? In a word, wow. We love our kale around here but I had never gotten around to trying it raw, and this salad was a revelation. The fun thing for us was that the salad was exactly the sort of thing we could imagine being served at our beloved Marlow and Sons, a beautifully balanced mix of textures and flavors, and endlessly adaptable with the seasons. As we ate, Mike and I talked about how we might riff on this as various things cycle through the farmers’ markets, and I expect some version of this kale salad is going to become a regular part of our dining repertoire. Being my food guru & knowing how you love kale, I would have thought you’d have tried it raw in salads already! Glad you decided on this recipe & look forward to hearing more about your wonderful creations. I often do a salad with chopped kale, thickly slivered Savoy cabbage, slivered red onion slices, roasted/cold beets wedges, orange segments & a mustardy/orange dressing with a smattering of feta cheese & toasted walnuts. 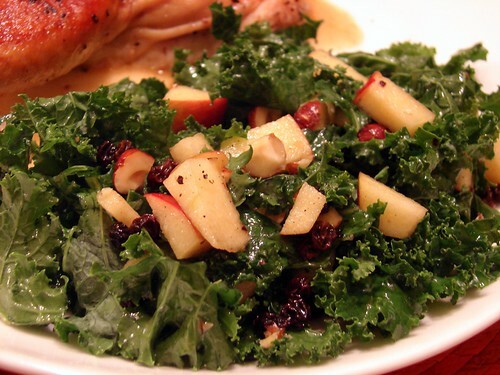 I know you will come up with even more interesting ideas for cold kale salads…I can’t wait!! I always thought I’d hate kale. I started juicing it first (the Tuscan or lacinato variety). Then I julienned it for a salad & LOVED it! It pairs beautifully with so many fruits, veggies and nuts! Can’t wait to see what else you’ll do with it. Love this series, Jen. You’re one of my cooking heroes.